The science, understanding, and regulation of Vapour Intrusion (VI) is dynamic and often complicated. Our Vapour Intrusion Video provides some background on VI. As the regulations change, the regulated community must consider how these changes impact environmental site assessments and remediation, as well as potential liability associated with VI. Below we provide a summary of provincial (and territorial, where data were available) guidance relating to VI. As more data and information are gathered, expect the VI regulations and standards to change. We will update this page as we learn about those changes; however, you should check with the applicable regulatory agency before making any decisions. If you would like to be notified when we update these pages, you can sign up for our newsletter on the right-hand side of this page. 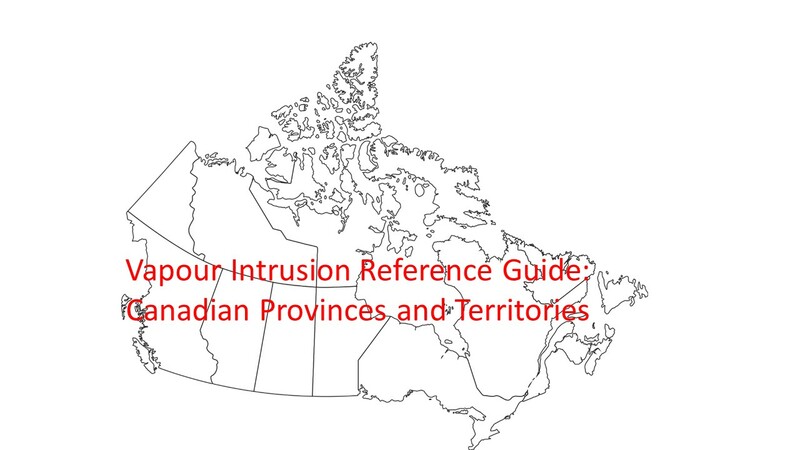 A one-page reference guide is provided for each province or territory listed below. In contrast to the results of our research in Dragun’s US Office (see Vapor Intrusion Reference Guide: State by State), there are very few established Vapour Intrusion Standards in Canadian provinces and territories. That said, for each VI reference guide below, we provide links to applicable regulatory agencies. Also, note that in the pages below we use the term “Vapour Intrusion Screening Levels” or “VISLs” as a generic term for regulatory standards. If you need assistance understanding/assessing/remediating VI, or if you have feedback regarding this page, please contact Christopher Pare, P. Geo. at 519-979-7300.